Group Events at Frizbee.at are super for the team spirit in your TEAM! NEW! Winter Disc Golf with Snowshoes! Disc Golf in Winter is awesome fun! We offer set dates from December to April or for groups of 10 persons or more individual appointments on 12 shorter forest "Approach and Putt" fairways. The Allgäuer Player´s League is the rating from a series of local tournaments for regional players, designed by Frizbee.at - Disc Golf Allgäu. Fun, often spontaneously organised tournaments regularly take place in Ofterschwang and anybody can participate! Players are rated in the frame of the Allgäuer Player´s Rankings. The 1st course record on the original 12 fairways was set on the 3rd May 2009 by Stephan Kessler from the Bavarian Airhawks Weilheim e.V. who threw a 34 (4 under Par). Bernhard Schleiermacher, also from the Airhawks, threw on the 27th September 2009 in his 1st round the same score. Then came Stefan Schäfferer and Harald Kucera on the Day of German Unity, again with 34! At the 1st Allgäu Open Günter Tanner set a new record of 29 throws (9 under Par). At the Summer Skim tournament on the 5th September 2010, with 2 new fairways, Michael Stelzer set a new course record of 36 throws (8 under Par) on the 14 fairways. On the 28th May, 2015, Allgäer Emanuel Kroll threw an outstanding 9 under Par while training! 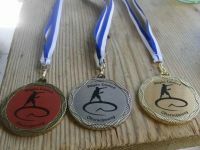 At the ALLGÄU LIMITED tournament on the 9th July 2011 all fairways were set at Par 3. Nikko Locastro (yep, that´s right... Nikko Locastro) threw an unbelievable 31 (11 under Par)... Now that´s tough to beat, right?! On the 25th June 2011 at the 2nd Big Hill King, Dominik Stampfer in his 1st Bogey-free round threw 9 birdies. The german Junior Champion threw 45, setting a new course record on 18 fairways. It was an inspiring, educational and socially awesome weekend with Top US Pros: Dave Feldberg, Eric McCabe, Nikko Locastro, Cale Leiviska, Paul Ulibarri, Paul McBeth, Will Schusterick, Melody King and Paige Pierce…Yep! They were in Ofterschwang!